The long-awaited opening of the newly renovated Island House restaurant took place just a couple of weeks ago, and we were eager to experience it for the first time. Four of our recent guests experienced the opening before we, and their visit came with a heart-warming story. 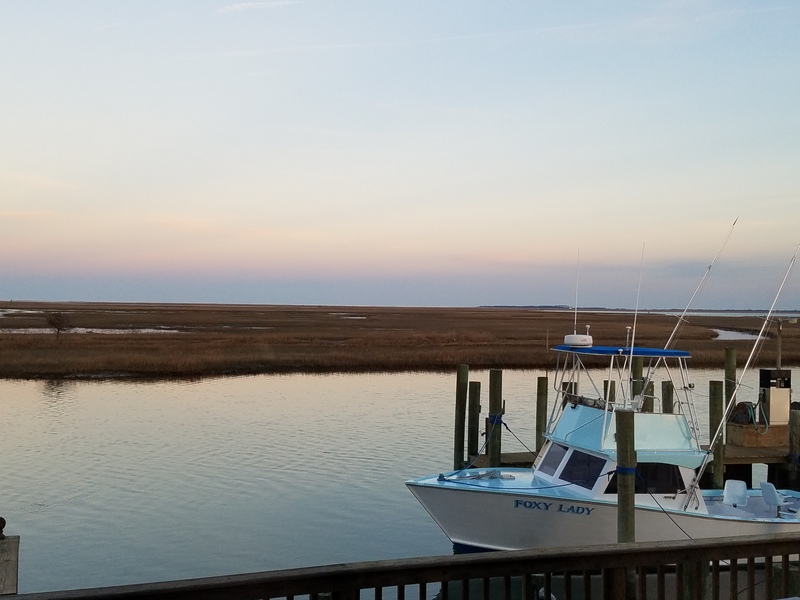 The view from nearly every seat at the Island House provides a fantastic view of the marsh and the west side of the barrier islands. The picture copied is from our visit. Outside, you see the fishing boat called “Foxy Lady.” Our guest is recently retired and was enjoying the view, as everyone does when he spied this fishing boat. He remembered a fishing trip he had on the Eastern Shore decades before with his dad. He knew it couldn’t be the same boat after all these years, but was compelled to stop by and chat with the Captain before the headed back to the inn. He recounted the victory over the fish that day long ago, when, as he told it, they caught hundreds of fish. That is the only reason he remembered the name of the boat was because of the epic fishing experience. When he told the Captain of the Foxy Lady the story, he smiled and said that must have been his dad at the helm that day. The Foxy Lady has been in his family for three generations, and while she has gone through some major upkeep (like most of us! ), it is in fact the same boat that conquered the seas those many years past. It seems like a familiar theme; multi-generational life experiences, Eastern Shore Friendliness (which will become its own adjective), and sparking or rekindling warm memories of a personal time on the shore. My review of the food and restaurant will come in a later blog, so until then, enjoy the snapshot and imagine what it must have felt like to remember such a fond childhood experience.